We are sad to report that despite keeping Achilles the grey seal pup alive since he was rescued on Saturday he sadly passed away during his operation earlier today. Achilles had a number of ailments and injuries and required an operation and after two days of intensive care he was taken to the vets earlier today, sadly he didn't make it through the procedure. All of the team and those involved did everything they could to help the rescued seal pup and all the team have been upset that we weren't able to save him. At 7.45am this morning the GSPCA emergency number was called to an injured grey seal pup at Petit Bot. GSPCA Volunteer Wardens Paul Duchemin and Neil Turner attended the scene were they were faced with a young male seal pup with a very nasty open injury to its back, weak and thin. The pup was rescued and brought directly to the GSPCA Animal Shelter in St Andrews were it was been thoroughly checked over by local vet and GSPCA President John Knight and Animal Collection Officer and Marine Medic Geoff George. Last week an extremely young grey seal pup with no mum in site was rescued in Alderney. Poppy as she has been called is responding well to treatment and has made it through the first 12 days at the GSPCA. The are now clear signs of her losing her white coat and we continue to do all we can to ensure she survives. 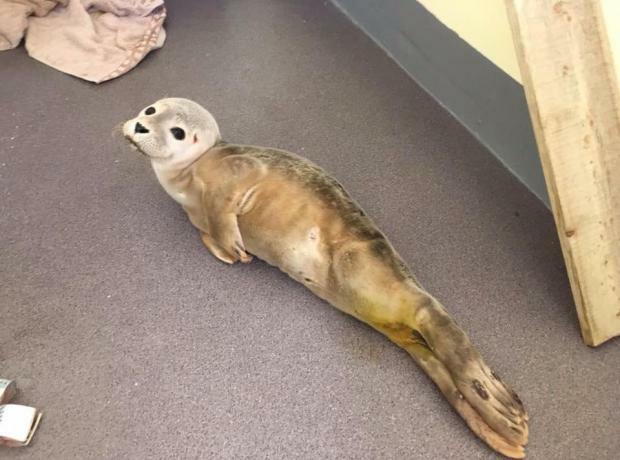 The GSPCA working with local vets have been giving Poppy around the clock intensive care in a heated isolated seal room at the Shelter and we are pleased to say she is now receiving fish as well as other treatments. On Monday a 2 to 3 day old grey seal pup with no mum in site was rescued in Alderney. Poppy as she has been called is responding well to treatment and has made it through her second night at the GSPCA. Already there are signs of her losing her white coat and we continue to do all we can to ensure she survives. Yesterday John Knight local vet and GSPCA President popped in to check her over and was pleased with her progress and condition. This afternoon the GSPCA received a call about a Grey Seal Pup from Alderney. 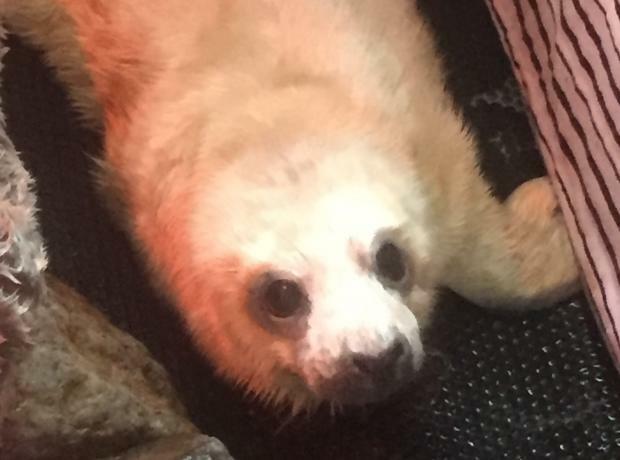 Alderney Animal Welfare Society called after a white coat seal pup had been spotted over the past two days with no mother in site. Rio the Common or also known as Harbour Seal Pup has made it through her first night although is still extremely thin and weak. Named Rio by the team at the Animal Shelter the young seal pup was rescued yesterday by Alderney Wildlife Trust and first taken to Alderney Animal Welfare Society where it was treated by Vet John Knight before being transported to Guernsey. At only 9kg she is the thinnest seal pup to be taken in at the GSPCA and first Common Seal to be seen in a very long time. Currently on route is an injured and sick young Common Seal Pup from Alderney. It was found and rescued by Alderney Wildlife Trust and taken to Alderney Animal Welfare Society where it was checked over and treated by Vet John Knight. 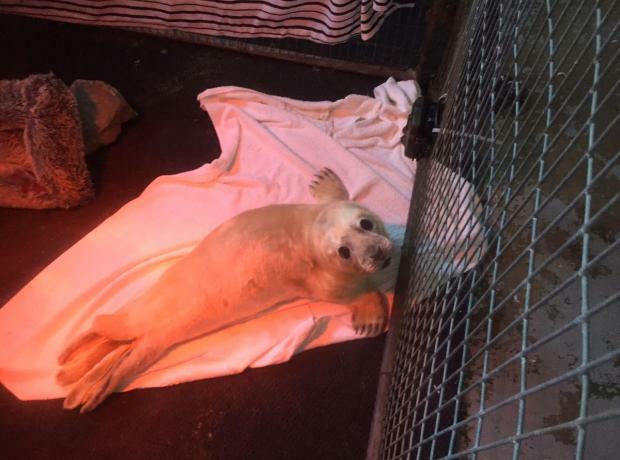 Although very rare for the Common Seal to be seen in the Channel Islands, this is the second to be rescued in a week as one was recently found sick in Jersey and was transported to the RSPCA in the UK. This pup will shortly be on route to the GSPCA to continue the treatment the vet has started. Yesterday the GSPCA were called out to an injured gannet at Jaonnaise Bay. Animal Collection Officer Geoff George attended the site where he had a fair walk to find the trapped bird. As the sun was setting during early evening Geoff found the poor bird trapped in discarded fishing netting. It was difficult to say how long the bird had been there so he quickly restrained the bird got it back to the van and brought the bird back to the Shelter in St Andrews. The bird has survived over night and staff are currently monitoring its progress. 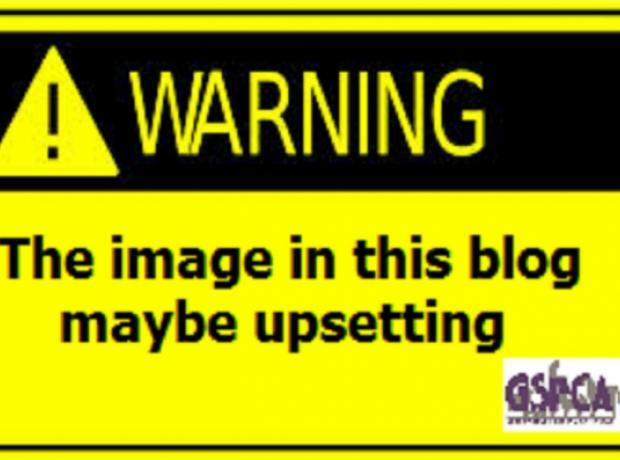 Last week at the GSPCA we issued a warning on waste and rubbish injuring animals, especially those at sea. 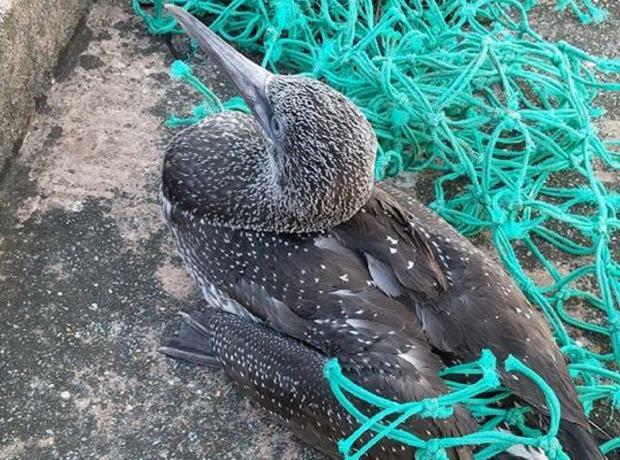 On Sunday the GSPCA were called out to an injured gannet at Port Soif. Emma Trousdale from the GSPCA responded in the ambulance to rescue a gannet that had a fish hook through her eye. Yvonne Chauvel Senior Animal Care Assistant said "We rescue and help animals 24 hours a day 7 days a week, but the gannet rescued on Sunday must have been in a great deal of pain and it is hard to say how long the fish hook had been through the eye."